Smiling isn’t just a facial expression that shows you’re feeling happy, it also helps connect with other people and put them at their ease. Various studies have also revealed that a white, healthy smile can lead to greater social acceptance and more job opportunities. Without the right care, however, your smile can cause you to lose self confidence and can also lead to a variety of dental problems. Here are 5 tips for a brighter, more healthy smile. As a Southampton dentist we bang on about brushing, flossing, and rinsing twice a day and that’s for a very good reason. The number one way to keep your teeth white and healthy and to fight off bacteria is with good home oral care. That said, it’s all about brushing and flossing properly for 2 full minutes a day, followed by rinsing with an antiseptic mouth wash. If you’re not sure how to brush and floss correctly then our hygienists can show you. Be aware of the foods you’re eating – It’s pretty obvious that the food you put into your mouth can have a direct impact on the condition of your teeth and gums. Foods which stain your teeth, are filled with sugar, or high in acid content, can all have a negative effect on the health and appearance of your teeth. By limiting your consumption of these foods and rinsing with water once you’ve eaten them, you can reduce your chances of decay and cavities. Whitening – although white teeth aren’t necessarily healthier, they are commonly linked with health. You can keep your teeth white by cutting down on drinks such as coffee, tea, and red wine. However, if your teeth are discoloured or stained then your cosmetic dentist in Southampton can offer you power whitening or home whitening treatments to restore your smile. Straightening – Unfortunately we aren’t all blessed with straight even teeth and conditions such as a cross bite, overbite, crowding, and gapping, can all impact on functionality and appearance. However thanks to a plethora of brace systems there’s something to suit all needs and budgets to straighten out your smile and make your teeth easier to maintain. Visit your dentist in Southampton – finally, it’s important to visit your dentist at least twice a year to keep your smile in tip top condition. Any problems can be detected early and fixed before they can develop into something more complex and expensive to rectify. In addition,the hygienist can remove plaque which you can’t remove by brushing alone, keeping your teeth healthy and clean. If you haven’t visited your Southampton dentist in a while, then it’s never too late to get back to good habits. Call Smilemakers today on 02380 442626 to book an appointment with Dr. Thomas Darling or contact us online at www.smilemakers.co.uk. This entry was posted in Healthy Teeth on 4th January, 2016 by Smilemakers. Tooth enamel for those of you who don’t know is the thin outer coating of the tooth which is there to provide protection to the tooth from everyday activities such as biting, crunching, and chewing. It also acts as an insulator against hot and cold temperatures. However, although enamel is an important part of a tooth’s composition, once it’s gone then it’s lost forever. Enamel is different from other parts of the body because it doesn’t contain any living cells, which means that it can’t regenerate and form new growth. Knowing this, it’s important for patients to take good care of their teeth so as to avoid excessive wear and tear or erosion of the enamel. Here are some of the things that can damage your tooth enamel and steps you can take to preserve it. Enamel erosion is triggered by a chemical acid process which occurs in two different forms – intrinsic and extrinsic. Intrinsic erosion is caused by internal matters such as gastrointestinal issues, acid reflux, dry mouth, eating disorders and genetics. Conversely extrinsic erosion is caused by external matters such as the regular consumption of acidic food and drink which elevates the amount of acid present in the mouth. In addition, behavioural issues such as tooth grinding, friction, stress, and corrosion can also lead to the erosion of tooth enamel. So how do you know if your tooth enamel is wearing thin? Well, if your teeth easily become discoloured after eating or drinking then it’s likely that your enamel has worn down. If your teeth feel more sensitive to hot and cold temperatures, then that’s another indication of enamel erosion; and finally if you’re suffering from enamel damage you may see small indentations on the surface of your teeth. Often taking these steps is sufficient to preserve tooth enamel but in more severe cases you may need to see your doctor for medical help relating to eating disorders or gastrointestinal issues. If your tooth enamel has been damaged beyond repair then you may need to seek the advice of a cosmetic dentist in Southampton to restore your teeth and your smile. If you’re worried about your tooth enamel then come and speak with Smilemakers and we’ll do all we can to help. You can make an appointment with Dr. Thomas Darling by calling 02380 442626 or contact us online at www.smilemakers.co.uk. We look forward to welcoming you to our clinic. This entry was posted in Cosmetic Dentistry, Healthy Teeth on 16th November, 2015 by Smilemakers. As a Southampton dentist we’re constantly telling patients that it’s important to floss their teeth at least once a day. When it comes to flossing many people consider it an inconvenience and simply don’t bother, thinking that regular brushing is all they need do to care for their teeth. If food and plaque isn’t removed from the base of the teeth where they meet the gums then it can harden and turn into tartar which can result in gingivitis, the first sign of gum disease. Although a Southampton dentist can treat gingivitis with a thorough scraping and cleaning of the area, if it’s left untreated then the plaque can spread below the surface of the gum and turn into periodontitis. Termed as severe gum disease, aside from swollen bleeding gums periodontitis can cause bone and tooth loss. Lack of flossing also causes an excessive build up of bacteria in the mouth. However, it’s not just the teeth and gums that are affected by this. Research has shown that bacteria and gum disease have been contributing factors to heart disease, diabetes and even respiratory problems. That’s why flossing is such an important part of your oral routine. So let’s take a look as 3 tips for maximising the effects of flossing. Always floss at night before you brush your teeth. This is more effective than flossing in the morning because it makes sure that food and bacteria aren’t left lingering in your mouth for the hours while you’re asleep. The best method of flossing is with a length of floss around 18 inches long. Wind each end around your fingers so the central area of floss is taut and then work methodically between each tooth taking it down to the gum line before bringing it back up. Try as well to hook the floss beneath the gum line. If you had a hard time reaching the back areas of your mouth or perhaps you’ve got arthritis, then you can buy devices which use water and air to remove plaque from the teeth, to make your task easier. Now you know more about the importance on your oral and bodily health of flossing then there really is no excuse for not doing it. It only takes a couple of minutes of your time and look at the benefits! If you’re overdue a check-up or your teeth need a professional clean then why not make an appointment with Dr. Thomas Darling at Smilemakers. We’re a general and cosmetic dentist in Southampton committed to providing our customers with all aspects of dental care and restoration. Call us today on 02380 442626 or book online at www.smilemakers.co.uk. This entry was posted in Healthy Teeth on 26th October, 2015 by Smilemakers. We like to regards ourselves as a family dentist in Southampton providing dental care through the generations. All of our treatments are tailored to meet the needs of our patients, which includes taking into account the age of our patients, since at different stages of life patients tend to have different dental care concerns. This allows us to decide which restorative procedure would be the most effective and which cosmetic treatment offers the perfect solution. This blog discusses some of the dental health and oral hygiene concerns that many senior patients face and helps you to understand what you may face health-wise as you too get older. One of our main services for senior patients is treating tooth decay and damage. Restorative treatment involves a variety of fillings, inlays, onlays, and crowns to rebuild and strengthen teeth that have been damaged by oral bacteria. 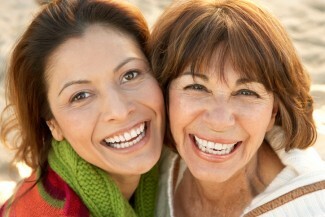 Older patients often suffer from gum disease and gum recession. When it comes to gum disease there are numerous antiseptic and antibiotic rinses that can be used to help bring the infection under control. With regards to gum recession then we may consider gum crafting techniques which build up the gum line. Tooth loss is a fact of life as people age and to replace missing teeth we commonly use dentures and bridges. However, dental implants are fast becoming a more popular option, even for the elderly, and these can be used effectively for single or multiple tooth replacement and even for stabilising wobbly dentures. TJM disorders is very painful and results from problems with jaw joints which pop, lock, or click. Fortunately a Southampton dentist can treat this problem in a variety of ways including dental restorations, the use of a bite guard and using implants for a better fit to dentures. The chances of getting oral cancer increases with age and it’s important to visit your dentist on a regular basis as they will be able to check your mouth for any obvious signs of oral cancer and/or carry out an oral cancer screen. Early detection means early treatment and more likelihood of a successful outcome. The salivary glands slow down with age and this can lead to the common problem of dry mouth. Sometime dry mouth can also be a symptom for a more serious health matter. We can treat dry mouth with a variety of artificial saliva products and give you tips for keeping your mouth moist and staying hydrated. Even though older patients have a number of unique dental concerns we never overlook the basics which is why we regularly carry out routine services on patients of all ages. This is the best way to improve and maintain good dental health for the foreseeable future. If you’d like to learn more about dental care for elderly patients then why not get in touch with Smilemakers. Our experienced and friendly team led by Dr. Thomas Darling will help you to have a healthy and beautiful smile whatever your age. Call us today on 02380 442626 to schedule a consultation or book online at www.smilemakers.co.uk. This entry was posted in Healthy Teeth on 5th October, 2015 by Smilemakers. As a Southampton dentist we find that cosmetic procedures such as smile makeovers are becoming increasingly popular as more and more people are looking to bring back their beautiful smile. However, if you’re already blessed with a great looking smile and really want to keep it that way then you might want to follow these 4 top tips. Did you know that tooth fractures are the third leading cause of tooth loss in the world today? The culmination of people living longer coupled with rising stress levels often cause teeth grinding or clenching known as bruxism. Unfortunately teeth grinding is a major cause of teeth fractures and around 10% of the UK population is thought to suffer from it. In many cases bruxism can be prevented simply by adopting a healthy lifestyle. By eating foods that are good for you, taking regular exercise, maintaining good sleeping patterns, and adopting relaxation techniques it’s possible to alleviate bruxism and therefore limit tooth fractures. When you’re younger it’s easy to think that your teeth are healthy so there’s no real need to attend dental check-ups regularly. This may be the case but the focus of a dental check-up is on prevention rather than cure. It’s all about fine-tuning your mouth making sure your teeth remain in great condition. For instance a professional clean performed by your hygienist will remove any calculus (tartar build up) that can’t be removed by normal brushing alone. If left, it can go on to cause major gum disease and in turn cause tooth problems further down the line. Apart from looking unsightly, those old fashioned silver-style fillings (known as amalgam) experience a degree of expansion and contraction when confronted with hot and cold liquids. This can exacerbate cracking in the tooth. White composites on the other hand are tooth coloured, so not only do they look pretty natural but they also help to reinforce the tooth, thus limiting cracking. Over time restorations made to your teeth can experience wear and tear. When this happens they no longer do the job they were supposed to do. Aside from this, advancements in technology (take the case of amalgams vs white fillings) mean that newer restorations not only function better, they look better too. With this in mind ask your dentist about replacing any old-style restorations with their modern counterpart. So there you have it, 4 top tips to retaining a beautiful smile! If you feel that you’ve lost your sparkling smile and really want to get it back then help is at hand. At Smilemakers Dr Thomas Darling and the team have the ability to help you regain your smile. Using a whole host of treatments including dermal fillers, skin revitalising, teeth whitening, and a range of teeth and gum repairs we’ll see to it that you can smile again with confidence. Contact your friendly Southampton dentist on 02380 44 26 26 or visit our website at www.smilemakers.co.uk to find out more. This entry was posted in Healthy Teeth on 13th July, 2015 by Smilemakers. In our younger years especially, it’s fair to say that dental check-up’s can often seem like an inconvenience at best and total waste of money at worst. After all, you might be under the impression that there’s nothing wrong with your teeth so why should you pay for something that doesn’t need fixing? Dr Thomas Darling a Southampton Dentist at Smilemakers explains. As dentists we perform a lot of routine maintenance in order to prevent problems that occur when patients don’t look after their teeth as well as they’re supposed to. Let’s face it, how many of us religiously spend the allotted 3 minutes, two or three times a day, brushing our teeth. It’s all too easy when you’ve got more important things to do to give them a quick going over. Therefore regular check-up’s are a kind of safety net or backup that helps keep your teeth in good condition. Aside from this, as dentists we’re trained to spot any anomalies or issues with your teeth that otherwise might go undetected. While these issues might seem minor now and are more often than not easily rectified, if you skip a visit or two, then there’s a strong chance that you may run into some very serious problems. So what type of problems? Firstly it’s natural for the body to produce plaque which collects around the base of teeth and gums when we eat and drink. If it’s not dealt with through proper brushing and flossing, it transforms into tartar which can no longer be removed by brushing alone. If tartar is left it can cause periodontal disease which gradually and silently eats away at the bone tissue, eventually weakening otherwise healthy teeth. The second type of problem is tooth decay. A small cavity is easily taken care of when spotted during a routine check-up. However if a cavity is allowed to escalate it can cause excruciating pain and eventually the loss of the tooth itself. You might feel that you can cope with the loss of one tooth, and indeed you probably can, but did you know that when a tooth is missing it sets off a catalyst of events that affect your remaining teeth and gums? The final issue is gum disease. Did you know for instance that there’s a strong connection between heart related problems and gum disease? Plaque produces a multitude of bacteria, most of which end up in the bloodstream. Increased bacteria in the blood can (if not dealt with) clog blood vessels which surround the heart. This entry was posted in Healthy Teeth on 6th July, 2015 by Smilemakers.